Hello, Walk’n Dogs Family! Rachel here. It’s been a while since my last blog, I hope everyone enjoyed their holidays and had a happy new year! 2019 is already off to a wonderful start and I’m so excited for what this year will bring. This blog is going to be explaining and painting a picture of my typical day to day as a dog walker. Yes, the life of a dog walker is totally awesome and fun, but with that comes some major responsibility and work. You may see commercials on television with one person walking 5+ dogs, smiling, running, with some fun music playing, their hair & makeup done perfectly and their clothes matching & clean as a whistle. Well, if you haven’t already guessed, this is not what a true dog walker’s life may look like (haha)! Yes, we do have our good days where we have it all together, the dogs are cooperating 100%, leashes are untangled and we aren’t tripping over our own feet, but there are far more “dog” days then there are “normal”. As a dog walker, I want to focus on quality, safety and treating each dog as individuals with their own unique personalities. Grouping them en masses in a busy city, is not safe, not smooth and does not make for a quality experience for either the dogs or the walker. Don’t get me wrong, there are dogs who can walk in a group setting who really enjoy the company, but for me, this is not my style and not the smartest way to go about it. Three dogs would personally be my maximum number to where I can still ensure a healthy and quality walk. Before I leave home, I typically take a look outside and appreciate such fine weather that I get to be out in all day, especially here in Florida. I might even go out with a small skip in my step, my jug of water in hand and be quick to fire up my car. I gear up with my: dog waste bags, extra leash, extra collar, my GPS route for the day, a towel, hand sanitizer, first aid kit and of course, weather-appropriate clothing. I then head over to start my day at my first clients home. Before entering a client’s home, I run through a quick mental check list. Where will the dog be when I come in? A crate? Roaming the house? Where is the leash? Is there an alarm code? Are there special instructions laid out on the table? Is there any medication I need to administer? If so, I double check my texts/notes to make sure I’ve got it right. Are there any other special instructions I should remember for today? Once inside, I handle the alarm first(if they have one), then greet the dogs with a healthy amount of enthusiasm. I’m always happy to see my fur-clients and they normally return my energy ten fold! Sometimes a particular dog might need a lower energy greeting due to age, health, etc. so they won’t get too riled up and that is just as perfect too. It’s all about forming bonds with each dog, ensuring trust with them and getting to know their personalities and needs. In my experience, dogs are a lot like little children. They need guidance, love, direction, discipline and positive energy. They will also test you to see what your boundaries and expectations are and then will respond accordingly. Truly fascinating creatures! After we greet one another, I try to get out on the walk as efficiently as I can. I try to give each dog as much outdoor and exploration time as possible so we usually get out in 1-2 minutes or less. Some dogs have particular routes they enjoy following and particular spots they like to check out, potty on and/or explore around. We always avoid long, straight stretches of major streets or intersections. In the summer, they’re way too hot anyways and they’re usually very busy. As we’re exploring the neighborhood, we normally avoid other dogs we may encounter on our walks. We don’t know them and it’s safer to not take the risk. We also keep en eye out for hazards on the sidewalk or grass, runners, bikers, skateboarders, cars, construction workers, delivery trucks; anything that is loud, moving quickly, has wheels and zips past has the potential to rile up any dog. I usually pet and encourage my dogs throughout the walk and just let them know I’m there and they can trust me to guide them. Some like to follow me and others prefer to lead. I don’t personally worry about which is right and I’m just fine with letting some dogs lead me. They will still respond to my direction and they know when to listen just by the energy I’m giving them throughout our time together. While they are walking at a comfortable pace and I have complete control over them, I snap a few quick pictures to send to their parents to ensure them they are having their much deserved walk and time outside in the fresh air. I also always send a small update, letting them know how they were doing overall physically and mentally. After were done with our walk and we’re back inside, I give them a few more pets and let them know they did a good job out on the walk. If they have treats waiting for them I’ll always reward them and make sure they are satisfied. Sometimes we may play and romp a bit before I leave or we may simply sit there and cool off together. I check their water bowls, make sure everything is secure inside and return them to the place where they spend the rest of their day. I pull out my phone and send over their pictures and updates. I do my best to provide accurate information and include a little extra about each dog’s time with me. I also have an open door policy, so no matter how small or seemingly insignificant, if anything is out of the dog’s ordinary routine, I will pass on that information to the owner. When we’re all communicating openly and honestly, the circle of trust remains strong and balanced. After six months of owning a dog walking business, I’d like to think I’ve seen it all, but I am always learning and always experiencing something new with the dogs everyday. As I’ve grown, I’ve also tried to become more educated about dog behavior, pet safety and each breed’s specific needs. I’m looking forward to continuing my journey as a small business owner and anticipate what the future brings. Dogs are truly a gift and when we recognize them as our friends, they are always thinking of ways to pay us back. 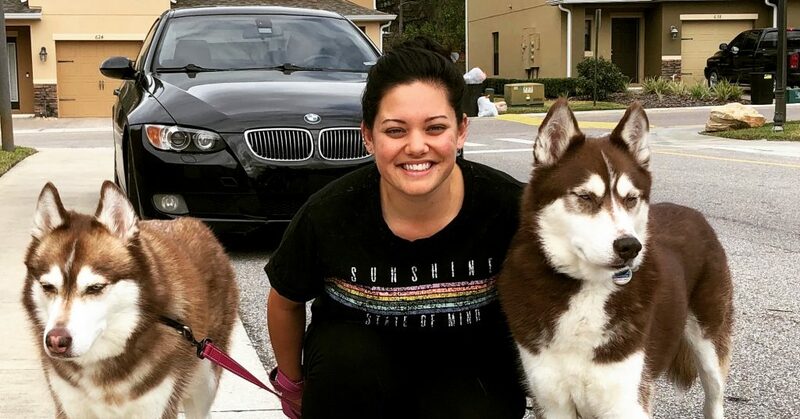 I hope this helped give you some insight of what I do as a dog walker, and if you are a client of mine, I hope this gave you a glimpse of what goes in while your fur-babies are in my care. Rachel is currently the owner/founder of Dip’n Dogs Canine Hydrotherapy and Walk’n Dogs – A Dog Walking Service in the Orlando, FL area. Dip’n Dogs provides water therapy for dogs with any orthopedic condition, degenerative disease, injury or obesity. Walk’n Dogs provides mobile in-home visits for dog walking. Each walk is customized to fit each dog and their needs. All walks take place at your home, in your neighborhood. Rachel caters to the Winter Park, Baldwin Park, Maitland andCasselberry areas. I am so blessed to have you helping with our babies. I love the pictures you send and I feel like family is walking them. You are the perfect provider for this active and meaningful service to your clients treasured pets.